Send online this Unique Premium Arrangement of Red Coloured Roses to your special one and express your love. 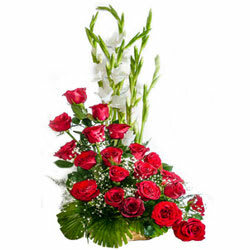 This bright array of Flowers is beautifully arranged with 15 Red Roses. Mould your relationships into more special ones by sending this Special Premium Arrangement of 24 Roses in Red Colour to the people you adore.